When it comes to graphic literature, do you like to “snack” on smaller, individual comics, or would you rather sit down to the “full meal” of a compilation? When publishing sequels, today’s comic book industry caters to both tastes. 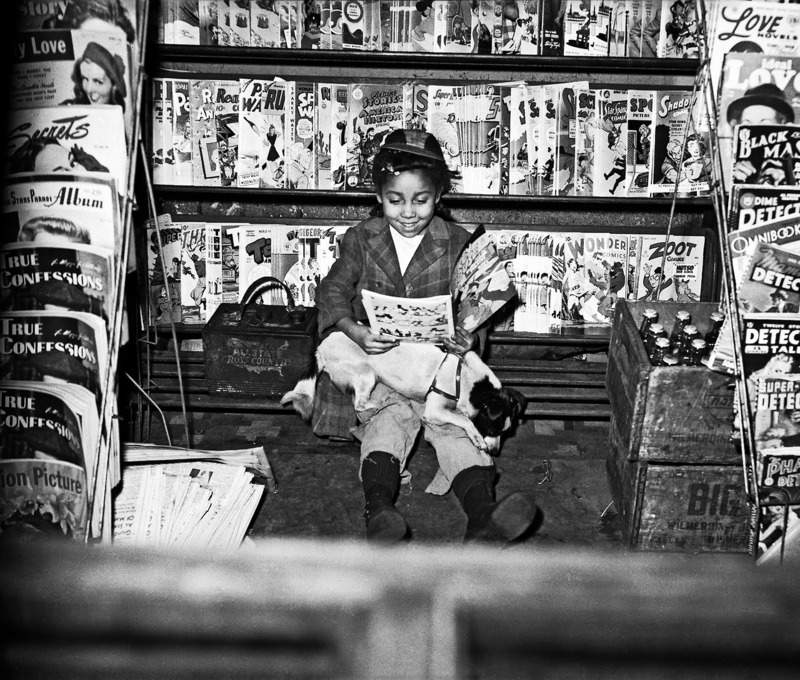 Some eager fans of the new Ms. Marvel, teen-aged Kamala Khan, recently “snacked” on new individual issues (numbers 6 through 11) of her adventures as they debuted separately each month. Other admirers of this Muslim-American superhero waited for the next “full meal” offered by Marvel Comics: a single paperback volume compiled of those issues, titled Ms. Marvel: Generation Why (2015). 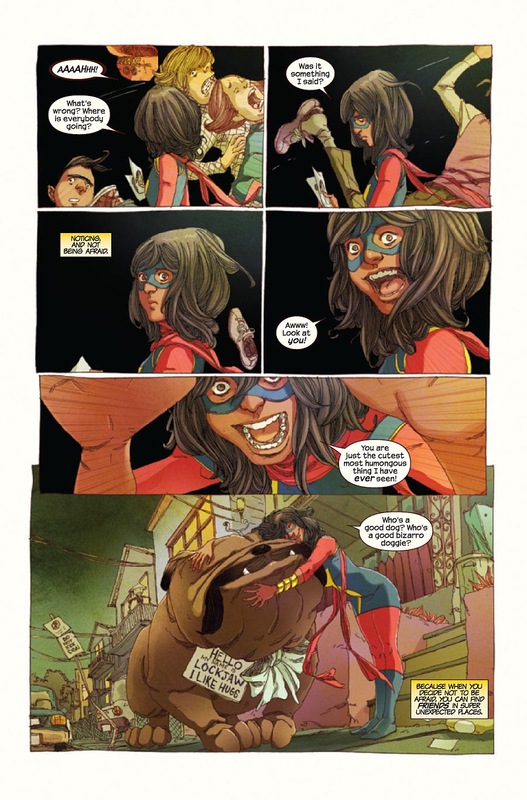 (Kamala’s origin story and first adventures—issues 1 through 5—are collected in Ms. Marvel: No Normal , reviewed here in January, 2015.) Today I want to describe how satisfying and rich this second volume is, and discuss how another highly-anticipated second volume, the autobiographical March, Book Two (2015), lives up to its award-winning predecessor. (I reviewed March, Book One  here in November, 2014.) The on-time, regularly scheduled appearance of these sequels is a dramatic contrast to two other notable, recent publications—books that took twenty-five years or longer to follow their original versions. The tween and up audience targeted by Ms. Marvel and March could have grown up and had teens of their own during this lag time! But I will touch on the merits and publication history of Here (2015) and the graphic novel Star Trek: The City on the Edge of Forever–The Original Teleplay (2015) at the end of this post. But such serious messages do not reflect the overall ebullience and sly wit that best describe the tone of this book. It’s just plain fun to read! Author Wilson has again effectively paired with gifted illustrators in the graphic storytelling of Kamala’s recognizable daily life, altered now by her superpower to change her body’s size and shape. (At one point, we even see Kamala camouflaging herself as a sofa!) The volume’s cover image sums up the overlapping strands in Kamala’s life: We see her using her smart phone with one hand while her other arm stretches way, way behind her to knock out a fleeing bank thief. Dollar bills, springing out of the thief’s satchel, cascade around the teen, dressed in a superhero outfit that—with its long sleeves, tights, and high neckline—conforms in part to Islamic rules of modest dress. 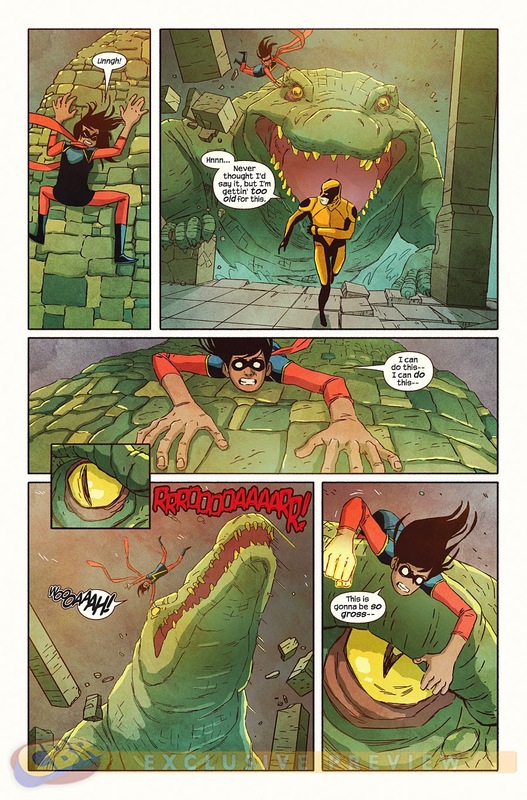 Jacob Watt is the illustrator for issues 6 and 7 here, while Adrian Alphona, the illustrator of Ms. Marvel: No Normal, returns as Wilson’s partner for issues 9 through 11. The cover art of volume two is also split, with Jamie McKelvie and Matthew W. Wilson responsible for issues 6 through 9 and Kris Anka supplying cover art for numbers 10 and 11. Wilson’s fresh dialogue nimbly intertwines with images in Generation Why’s two related story arcs. In the first, Kamala teams up with one of her personal heroes—Marvel Comics superhero Wolverine. With believable teen enthusiasm, she bounces up and down excitedly and enthuses, “I totally put you first in my fantasy hero team-up bracket!” Wolverine, bewildered, replies “Huh?” The two confront gigantic, mutated alligators in a booby-trapped lair as they foil a plot by the bird-headed supervillain Inventor. Along the way, Wolverine offers Kamala some wise adult advice. We also learn just how Inventor came to have that bird’s head. While Wolverine would prefer to keep this adventure private, he learns that he is no match for a quick-fingered, tech-savvy teen. Kamala has “already pictogrammed [the] whole episode” and put it in online. In the second story arc, Kamala is accompanied by an enormous, super powered dog named Lockjaw, a gift from another new figure in Marvel Comics’ expanding universe of characters. With the help of her classmate/sidekick Bruno, Kamala foils another of the Inventor’s plots, along the way shrinking herself down to mere inches to stop the gears of one of his dastardly inventions. The colorful details in that full-page image, where we see mice contentedly living in the spaces between cogs, along with the varied, rich hues used throughout this second volume, make following Kamala Khan’s adventures a visual treat. A variety of close-ups alternate with long and mid-distance views, along with different sizes and colors for lettered sound effects, adding further “punch” to that extended final battle. Elsewhere, even in quiet moments, our lingering eyes are consistently rewarded, as when we notice on the cover of issue 11 that hungry Kamala is devouring a cupcake with such gusto that she has an icing mustache. This Ms. Marvel—shown sometimes wind-blown, stumbling, and sloppily-dressed—is one that young readers will readily relate to, as she is still learning how to be an adult as well as a superhero. Whether readers recognize their own community in Kamala’s or see one somewhat different from their own, the expert graphic storytelling here makes reading this book a pleasure. 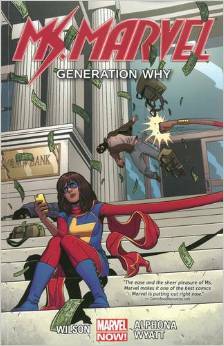 Ms. Marvel: Generation Why is currently on the New York Times bestseller list, while the first volume about superhero Kamala is a finalist for a 2015 Hugo Award as well as an Eisner Award for best new series. Author Wilson and artist Alphonsa are also finalists for individual Eisner Awards. With March, Book Two, we move from fantasy to history. This middle book in a planned trilogy continues to depict the inspirational life story of Congressman John Lewis, the notable civil rights leader who today still represents Georgia citizens. While March, Book One described Lewis’ boyhood and some activities leading to the historic 1965 protest on the Edmund Pettus Bridge in Selma, Alabama, Book Two focuses on the painful battles for equal rights fought between 1961 and 1963. These include the beating, jailing, and assassination of protestors in the segregated South—some of these assaults being condoned or even committed by police. We see adult “Freedom Riders” being assaulted as they attempt to desegregate buses, and we also see children gathered on city streets being battered by torrents of water from high-power fire-hoses. Then, with almost incredible brutality, police dogs are ordered to attack the children. 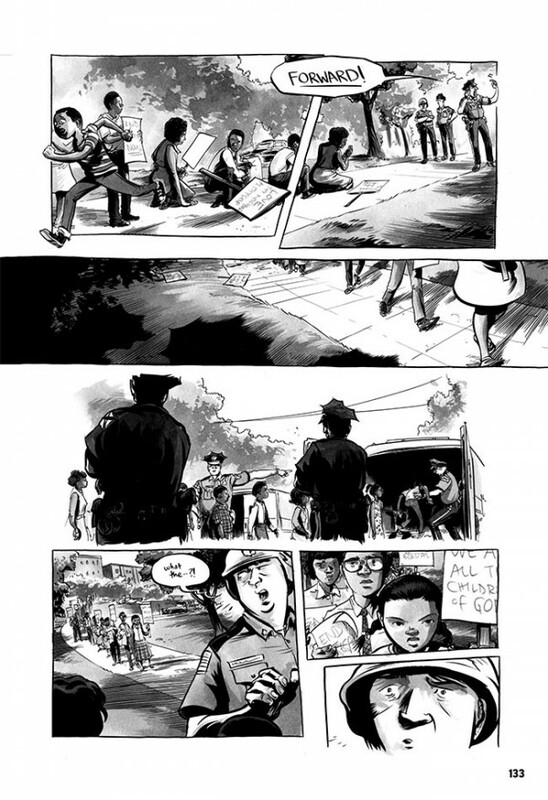 In this sequel, co-authors Lewis and Andrew Aydin, together with phenomenal artist Nate Powell, continue the dramatically compelling framework begun in Book One: all these events are juxtaposed against the historic 2008 inauguration of Barack Obama, the United States’ first Black president. The exclusive use of black, white, and grey shadings is an effective technique in both March volumes. Black backgrounds emphasize the figures of important civil rights leaders, as we learn more about the inner workings and lesser known heroes of that movement, while gradations of black and grey dramatize the terror of unjust, at times brutal imprisonment and violent attacks. Powell frequently links panels of different sizes and perspectives with word balloons or lyrics banners that reinforce the relationships among the scenes they depict. One especially telling double page spread organized in this way juxtaposes Aretha Franklin’s full-throated rendition of “Let Freedom Ring,” sung at President Obama’s inauguration, with smaller, inserted panels showing the aftermath of a 1961 assault on Freedom Riders in Montgomery, Alabama. The confused revulsion there of one young boy as he looks at his bloodied hands, having been egged on by his mother to attack Blacks, is an especially telling image. His reaction is a sharp contrast to the smug self-satisfaction of a uniformed police officer also present during that attack. As current events show, violence against Blacks in the United States—despite hard-won changes in the law—continues to harm our citizens and society. Congressman Lewis’s sad, angered tweets about current violence against Blacks appeared in a Washington Post article about the March books. The power of March’s graphic storytelling is so great that thirty school systems have already added these volumes to their curriculum, and they are also included in some university courses. Media coverage such as the Rachel Maddow interview of the books’ creators, which intersperses historical TV news coverage with pages from the books depicting these filmed events, further heightens public awareness of this history. 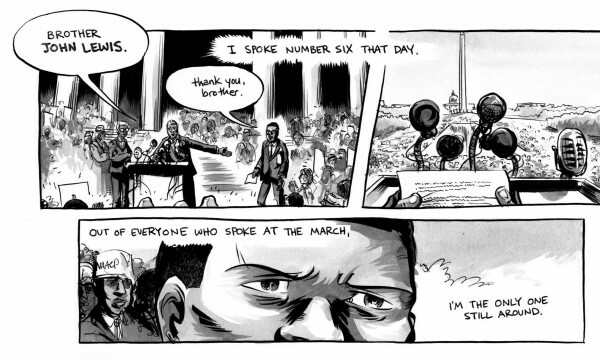 Yet the eloquence of both written versions of Congressman Lewis’ speech at 1963’s watershed D.C. rally for civil rolls right off the page, its message also communicated through Nate Powell’s sometimes wordless but equally eloquent images. 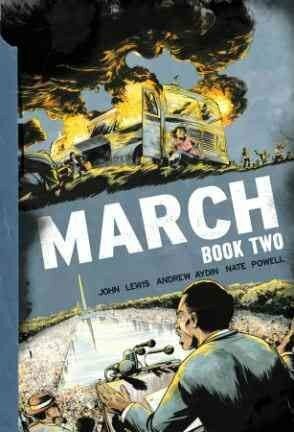 March, Book Two concludes by spotlighting one shockingly memorable day: at the bottom of the last page, we are shown the interior of a fire-bombed church in Birmingham, Alabama, on Sunday, March 15, 1963. Adults call the names of two young girls, not yet knowing they have been killed by this blast, while in the middle of the page, the stained-glass face of Jesus Christ has been obliterated. At the page’s top, the extended wail of approaching rescue vehicles seems to comment on the horror of this man-made, religion-defiling event. Asked when March, Book Three might appear, Congressman Lewis has said that, just as the civil rights movement took years to achieve some goals, publication of that volume may take some time. Yet the 17 months between publication of the first two books, as well as their rousing reception, suggests we will surely see the trilogy completed within this decade. 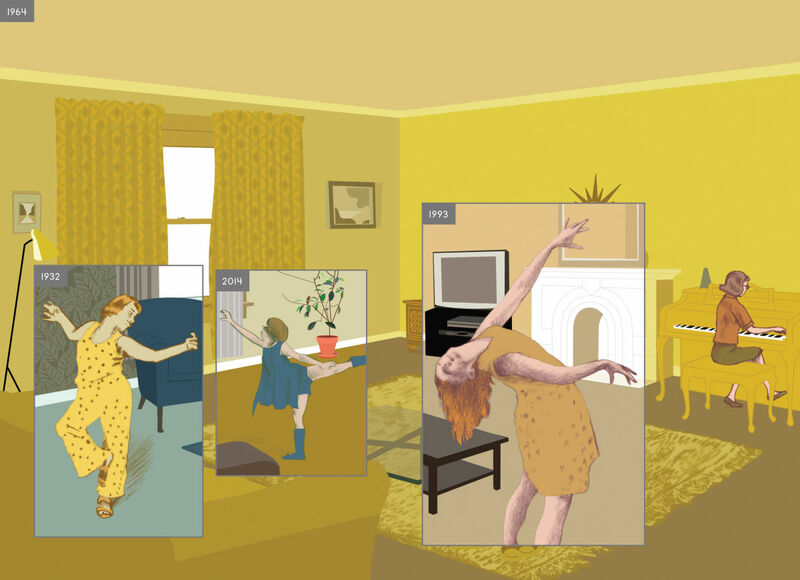 That pace is distinctly faster than the publication record of lauded author/illustrator Richard McGuire’s Here (2015). This visually engrossing, nearly wordless book—depicting the history of one location in New England from prehistoric times through our own distant future—sprang from a six-page, black-and-white comic strip that appeared in 1989. 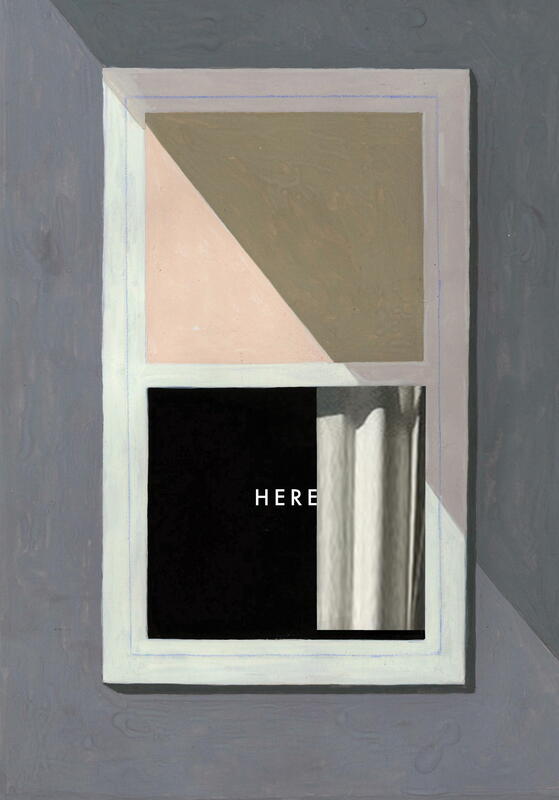 Each page of Here depicts a moment of time in this space, but other frames depicting other moments also appear in many of these pages. In 1989, this was an innovative technique that influenced other graphic novelists, such as award-winning Chris Ware. Today’s book-length work—now drenched in luminous color but still set primarily in the living room featured in the 1989 version—was so eagerly anticipated that Here’s development was itself the focus of a recent museum exhibit. While older readers will “get” more of this volume’s historical references and psychological subtleties, even upper elementary-school kids who enjoy challenges can appreciate its narrative layers, surprises, and occasional humor. Readers of all ages interested in décor and fashion will find the changings styles of the people and furnishings in Here a delight. 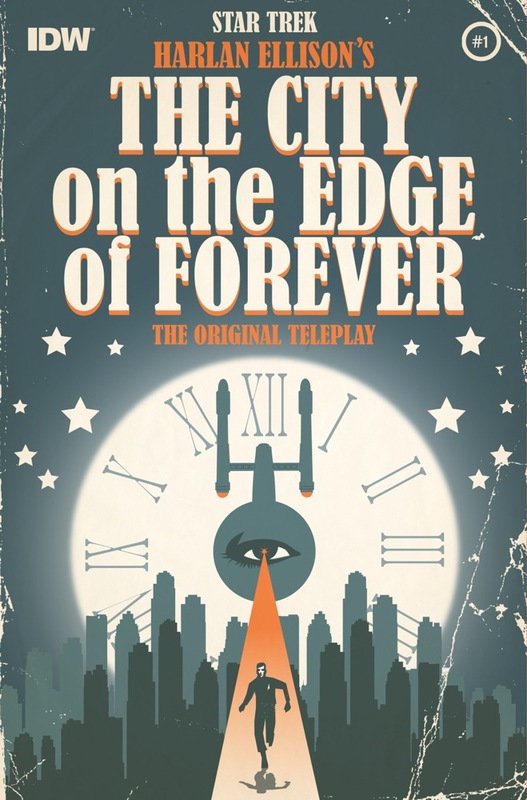 Not twenty five but forty-eight years separate graphic novel Star Trek: Harlan Ellison’s City of the Edge of Forever, the Original Teleplay (2015) from its source material! That popular episode of TV’s first Star Trek series debuted in 1967. Its tale of accidental time travel back to the 1930s and attempts to save and return to the future was an instant hit. Ever since, though, science fiction luminary Harlan Ellison has maintained that the show’s producer broke faith and contracts by changing Ellison’s original script. Ellison even wrote a book in 1995, containing alternate versions of his original teleplay, about this conflict. Surprisingly, despite this discord, Ellison himself approves of the graphic adaptation of his work, in its Foreword and Conclusion praising authors Scott and David Tipton and illustrator J. K. Woodward. This praise is justified. The pace of this graphic novel, its smart alternation of color with black-and-white for character-specific conflict, and use of pithy dialogue make it a very good read. First appearing as five separate comic books, this compilation volume issued by IDW Publishing now seems just like a TV show, with four high-tension moments (the issues’ cliffhanger endings) acting as “breaks” for commercials. Some familiarity with Star Trek will enhance reader enjoyment of this well-done graphic novel, but extensive knowledge is not necessary. Still hungry for graphic snacks or meals? A highly anticipated new movie featuring Marvel Comics’ characters debuts today—The Avengers: Age of Ultron. There are also rumors that more than one upcoming Avengers comic book will include guest appearances by Kamala Khan. But even before that, stop into your local independent comic book store on May 2. 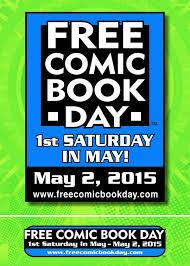 Since 2002, the first Saturday in May has been “Free Comic Book Day” in these stores, which have a limited number of specific titles that publishers make available for free. Here is a link to a list of this year’s free books, some better suited to young readers than others. As for me, I will satisfy my appetite for the new Ms. Marvel by sitting down to late June’s “full meal” of Ms. Marvel, Volume 3: Crushed (Ms. Marvel issues 12 to 15 and Shield #2). Will I also resist “snacking” if I wander into a comic book store before then . . . ? I make no promises. This entry was posted in biographies, comics, graphic novels, memoir and tagged Adrian Alphona, Andrew Aydin, Barack Obama, civil rights, comic book compilations, comic books, Congressman John Lewis, David Tipton, desegregation, Eisner Awards, Free Comic Book Day, Freedom Riders, G. Willow Wilson, Harlan Ellison, Here, Hugo Awards, Islam, J.K. Woodward, Jacob Watt, James McKelvie, Kamala Khan, Kris Anka, Marvel Comics, Matthew W. Wilson, Montgomery Alabama, Ms. Marvel, Ms. Marvel: Generation Why, Ms. Marvell: No Normal, Muslim-American superhero, Nate Powell, Rachel Maddow, Richard McGuire, Scott Tipton, Selma Alabama, Shield, Star Trek, Star Trek: City on the Edge of Forever: The Originial Teleplay, The Avengers, The Avengers: Age of Ultron, Volume 3: Crushed, Wolverine. Bookmark the permalink.